Aaron Crow is currently a Water/Wastewater Project Engineer for CHA in Indianapolis, Indiana. As a CHA employee, he works as a service provider to Citizens Energy Group, maintaining and updating the entire model of the Citizens’ drinking water distribution system. Aaron is responsible for responding to requests from commercial or residential developers such as requests for fire flow analysis (identifying pressures and available flow at fire hydrants before and after a building has been built and a fire hydrant has been opened) and proposed alterations to the water distribution system. Aaron said that the majority of his junior and senior courses have been very applicable to the work he is doing now. His classes prepared him technically in using GIS systems (Citizens uses ArcMap) and modeling software like HEC-RAS, HEC-HMS, and KYPIPE (taught in CE44000 – Urban Hydraulics and CE54900 – Computational Watershed Hydrology). Aaron has many positive experiences that have stayed with him from his years at Purdue. He cited working collaboratively with professors and peers in EEE was one of the best parts of the program. From these exchanges, Aaron said he learned how much he values performing analyses through conversation and collaboration with coworkers, an essential part of his role as an environmental project engineer. Shelley Koehn is currently a Consultant with Trinity Consultants in Lake Elmo, Minnesota. She is responsible for submitting air quality permit applications for various sites throughout Minnesota, Wisconsin, North Dakota, and South Dakota. She is responsible for completing emission calculations for all units on site, completing the required permit application forms, and conducting regulatory reviews at both the state and federal level. Shelley also assists with air dispersion modeling for facilities when required. She also assists facilities with preparing emissions inventories and annual reports. 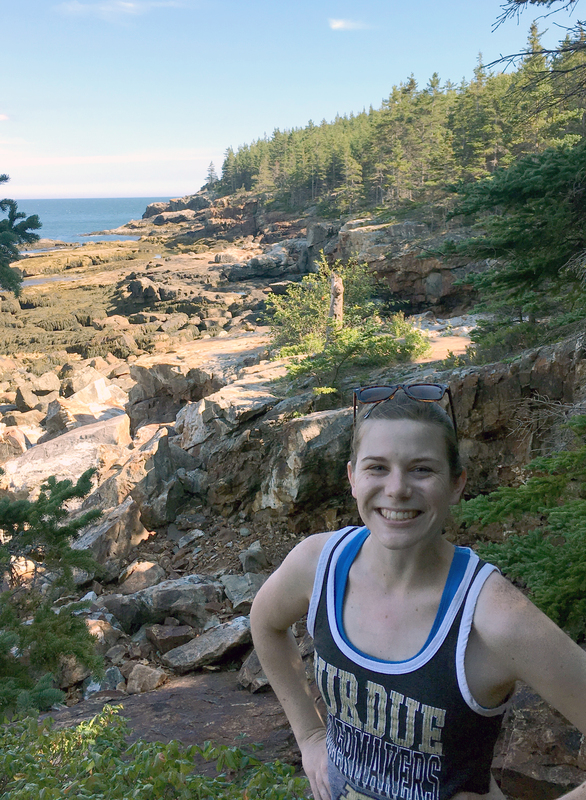 During her internship with 3M, Shelley spent a summer reviewing the applicability of NSPS Kb (40 CFR 60, Subpart Kb), a federal regulation for newly installed storage vessels, to the different tanks at one of their facilities. “Since starting at Trinity, I've had to reference the same rule - it always brings me back to my intern days,” Shelley mentioned. She also finds that she regularly uses material from Dr. Jacko's air courses. The skills learned through her degree have proven to be useful when working through projects on the job. Shelley said that it has been interesting to learn more about the different career opportunities available to EEE graduates. While she personally pursued a consulting job, Shelley mentioned that it’s exciting to see what positions are available in environmental divisions at larger companies or through government agencies. Shelley pointed out that one advantage of being a Purdue graduate is the large alumni network. “Some of the first connections I made when moving to the Twin Cities were Purdue alumni I had met in college, or had been introduced to by mutual friends,” she said. “I’ve attended several events hosted by the Twin Cities Alumni Club.” And by moving to another Big Ten state, Shelley can proudly cheer for the Boilermakers when they come to Minnesota to play the Gophers!